Great for Providing Support During Activity! There are two bladers per side of the support, should they both have gel in them? In order to freeze the gel packs, is it better that I remove them separately from the cast or should I just stick the entire cast into the freezer? Place the entire brace in the freeser so that you do not take the glue that holds the gel inserts off and they do not stick anymore. What is the gel inside the green shell made out of? I wear 16 medium shoes to leave room for my orthotics, but my feet are probably size 15. My right ankle turns very easily and I would like to find some ankle braces that I can wear daily if necessary that will fit my foot. My ankle measures 13 inches. What product do you recommend? The ProCare Surround Gel Ankle Support will provide you with a good amount of support to keep your ankle from rolling. The foot portion of this brace, where your heel sits is adjustable. The size you order will be based on the height of the rigid shell. Small = 8.5", medium = 9" and large = 10". Thank you for your question. On the sizing, I don't understand. You have large as 10; what does that mean? It means the brace is 10 inches in height. It wouold depend on hwo tall you are as to which brace you would need, the 10 inch would be for someone tall as the have a long tibia and fibula. Can you wear this brace in the water?getting in and out of beach area.also for showers. Yes you can wear this brace in the ocean, we recommend rinsing it out after you exit. Am I supposed to wear the brace overnight with a high ankle sprain, and alot of swelling? We recommend that you speak with the doctor who treated you for your high ankle sprain for his recommended use. Because doctors' treatment protocol varies, it is best that you consult him for his treatment plan. The gel bladder in my support ripped. Can I buy a replacement? Unfortunately you cannot. If it's less than six months old however, you can get a replacement under warranty. Call customer service at 1-800-553-6019. I have the same problem with fitting the brace into my shoes and I was wondering if I could wear the brace with flip flops? Or do I need to wear a tennis shoe for support? It is reccommended that you wear those ankle braces in your tennis shoes. For safety reasons do not wear these with flip flops. How do you add air to the green thermoplastic shells? 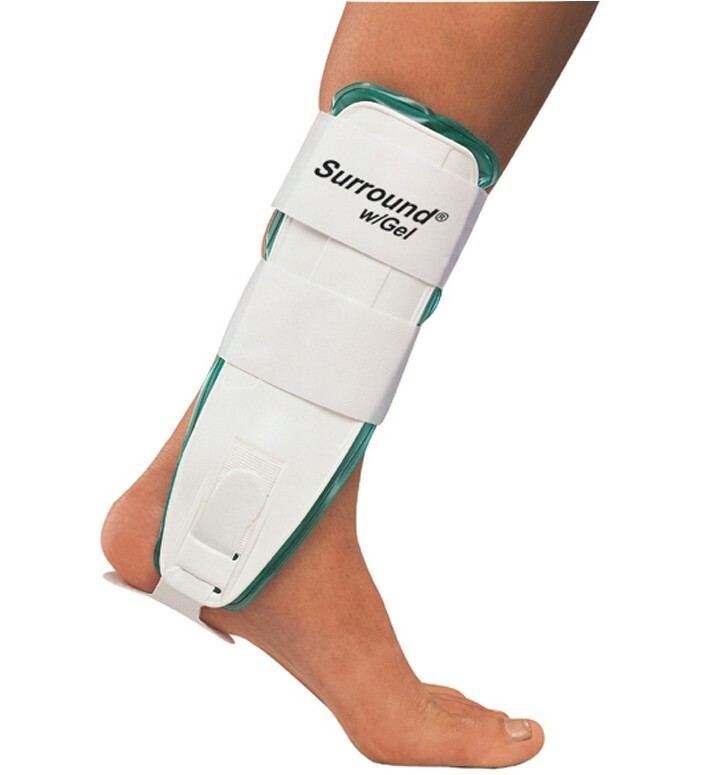 The ProCare Surround Gel Ankle Support does not have inflatable aircells. The green thermoplastic shells are filled with gel that can be used as a form of cold therapy treatments. How do I wear the ProCare Surround Gel Ankle Support with a shoe? What kind of shoe should I wear? The brace is too wide to wear with my tennis shoes, etc. Usually an athletic shoe is best type of shoe to wear with this ankle brace. You may need to loosen the laces pretty good as the brace itself adds some bulk and you may have some swelling as well. I like this ankle support it because it helps with the pain and is not bad to handle or deal with at all for my ankle sprain. Sprained my ankle last May, this really helped! I sprained my ankle last May while hiking with my brother and his girlfriend. I would up going to the doctor the next day -we were hiking an hour after it closed and nobody was home to drive me to Urgent Care almost an hour away- and after a few x-rays and other things to see what may be wrong, they came to the conclusion I had a severe sprain and fitted me with a Surround Gel Ankle Brace. Thanks to this brace, I didn't need crutches for a severe sprain!